for the Northeastern University District Event, the team’s third tournament of the season. Along with 39 other FRC teams from around New England, they eagerly anticipated their final game before District Championships. Even though they started off rough with several technical field issues during qualification matches, Mechanical Mayhem ranked first by Saturday afternoon with an average score of 147.67 points. 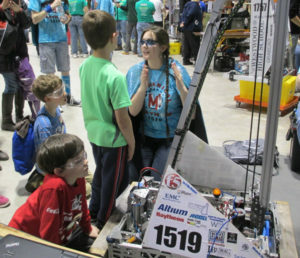 During alliance selection, Team 1519 chose the NUTRONS (125) from Boston, MA, and The Robotics Team (1786) from Dublin, NH, to create the first seeded alliance. After being temporarily bumped down to second ranking in quarterfinals, this alliance made a strong comeback for semifinals and remained the first ranking alliance. In the final rounds, Mechanical Mayhem’s alliance defeated the second seeded alliance consisting of the Robo Chiefs (1768) from Bolton, MA; the LigerBots (2877) from Newton, MA; and the Robonauts (663) from Whitinsville, MA. After an exciting victory on the field, Team 1519 was thrilled to also win the prestigious Chairman’s Award. To view Team 1519’s matches from this tournament, visit the 2015 NE District Northeastern Universityplaylist on Mechanical Mayhem’s YouTube Channel. Team 1519 continues to improve while anticipating the upcoming New England Championship, which will be held on April 8-11 at Worcester Polytechnic Institute (WPI). At this competition, 60 teams will battle for the honor of being one of the 35 teams who will represent New England at the FIRST Championship in St. Louis on April 22-25.